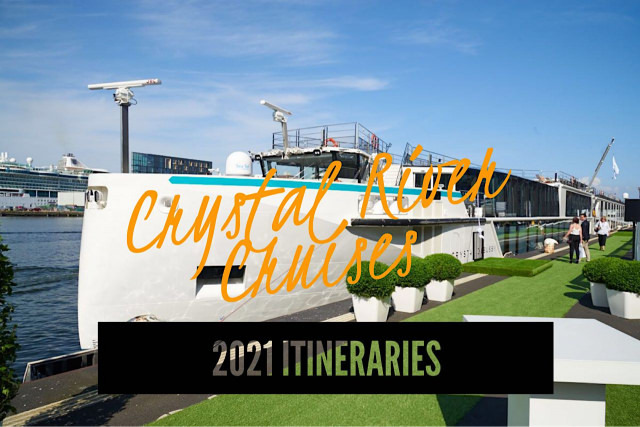 Crystal River Cruises announced the complete deployment for its fleet in 2021. The line’s five river ships – Crystal Mozart and the four identical sister ships Crystal Bach, Crystal Debussy, Crystal Mahler, and Crystal Ravel – will sail the Danube, Rhine, Main and Moselle rivers on itineraries of seven to 16 days. With 45 unique ports of call, dozens of which are designated UNESCO World Heritage Sites, every voyage features at least one overnight stay, many with double and even triple overnights, allowing guests to further immerse themselves in the port, or venture to nearby towns. Legendary Rhine, 7 nights, Basel to Amsterdam- Featuring overnights in Koblenz and Amsterdam; calling in Cologne, Rüdesheim and Mannheim, Germany; and Strasbourg, France. Romantic Rhine, 7 nights, Amsterdam to Basel – Featuring overnights in Koblenz and Amsterdam; calling in Cologne, Rüdesheim and Mannheim, Germany; and Strasbourg, France, and cruising through Boppard and Lorelei, Germany. Tulips and Windmills, 7 nights, Amsterdam Roundtrip – Beginning and ending with overnight stays in Amsterdam; calling in Kinderdijk, Hoorn, Rotterdam and Middleburg, Netherlands; and Ghent and Antwerp, Belgium. Enchanting Moselle, 10 nights, Amsterdam Roundtrip – Featuring overnight stays in Amsterdam, Netherlands, and Trier, Germany; calling in Dusseldorf, Koblenz, Bernkastel, Cochem and Bonn, Germany; and Arnhem, Netherlands. Rhine Christmas Markets, 10 nights, Amsterdam to Basel/Basel to Amsterdam – Beginning and ending with overnights in Basel and Amsterdam (double overnight), as well as overnights in Koblenz, Germany; calling in Rüdesheim, Speyer, Breisach, Cologne and Strasbourg, France. Eastern Danube Discoveries, 11 nights, Vienna Roundtrip- Beginning and ending with overnights in Vienna; also calling in Esztergom, Budapest, Visegrad, Mohács and Kalocsa, Hungary; Bratislava, Slovakia; Vukovar, Croatia; Belgrade and Novi Sad, Serbia and cruising through Iron Gate Gorge. Delightful Danube, 7 nights, Budapest to Regensburg/Regensburg to Budapest – Featuring overnights in Budapest, Regensburg, and Vienna; calling in Dürnstein and Melk, Austria; and Passau, Germany, as well as cruising the Wachau Valley. Danube Serenade, 7 nights, Vienna to Budapest/Budapest to Vienna – Featuring overnights in Vienna and Budapest; calling in Dürnstein, Melk, Linz and Krems, Austria; and Bratislava, Slovakia, and cruising the Wachau Valley. Treasures of the Danube, 10 nights, Vienna Roundtrip – Beginning and ending with overnights in Vienna and also overnighting in Budapest and Passau; calling in Bratislava, Slovakia; Dürnstein, Melk and Linz, Austria; and cruising the Wachau Valley. Christmas Wonders of the Danube, 7 nights, Budapest to Passau/Passau to Budapest – Featuring overnights in Vienna and Budapest; calling in Bratislava, Slovakia; Krems, Melk and Linz, Austria and cruising the Wachau Valley. Grand Europe, 16 nights, Budapest to Amsterdam/Amsterdam to Budapest – Overnighting in Budapest, Vienna, Amsterdam, Regensburg (westbound only) and Rüdesheim (eastbound only); calling in Bratislava, Slovakia; Dürnstein and Melk, Austria; and Passau, Regensburg, Nuremberg, Rüdesheim, Bamberg, Cologne, Miltenberg and Würzburg, Germany, as well as Koblenz, Germany and the Rhine Gorge on the westbound route; and cruising the middle Rhine Valley. December 22 – Crystal Ravel Holiday Cruise, 11 nights, Budapest to Regensburg with New Year’s Eve in Regensburg – Beginning and ending with double overnights in Budapest and Regensburg (including New Year’s Eve), respectively, including New Year’s Eve, and also overnighting in Vienna; calling in Passau, Germany; Krems, Melk and Linz, Austria; and Bratislava, Slovakia. December 22 – Crystal Bach Holiday Cruise, 11 nights, Basel to Amsterdam with New Year’s Eve in Amsterdam – Beginning with three nights in Basel (including Christmas Eve and day), ending with a double overnight in Amsterdam (including New Year’s Eve) and also overnighting in Breisach; calling in Strasbourg, France; Mannheim, Worms, Rüdesheim, Koblenz and Dusseldorf, Germany; Arnhem and Lelystad, Netherlands. December 23 – Crystal Mahler Holiday Cruise, 10 nights, Regensburg to Budapest with New Year’s Eve in Vienna- Beginning with an overnight in Regensburg and ending with a double overnight in Vienna (including New Year’s Eve) and also overnighting in Linz and Budapest; calling in Melk, Austria; Passau, Germany; Esztergom, Hungary; and Bratislava, Slovakia.